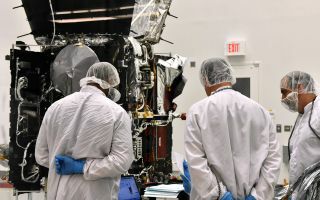 The team performed final checkouts of the Parker Solar Probe last week, before the probe shipped to the launch site. In the wee hours of the morning (approximately 4 a.m. EST) on Sunday (April 1), the "coolest, hottest mission to the sun" took off aboard a C-17 aircraft, bound for the Space Coast of Florida. Once the spacecraft arrives there, it will be prepped for a July 31 launch. The probe is currently scheduled to lift off from Cape Canaveral on July 31 atop a United Launch Alliance Delta IV Heavy rocket; the spacecraft will then race toward the sun at approximately 450,000 mph (720,000 km/h). Parker Solar Probe will arrive at the sun in November and then spend seven years studying the star from 3.7 million miles (6 million km) away, eight times closer than any other spacecraft that's come before it. A view of the solar limb sensors: If there is an attitude error, these parts of the spacecraft will see the sun first, spurring the probe to adjust its position. During the mission, the craft will make 24 orbits around our star, while passing by Venus seven times for gravity assists. The probe will employ its suite of instruments to help unlock the mysteries of the sun, while trying to survive the encounter with our star. Protecting the craft is a one-of-a-kind heat shield, an engineering marvel built to withstand searing temperatures of 1,400 degrees Celsius (2,550 degrees Fahrenheit) during closest approach, Fox said. Parker himself proposed one of the leading explanations for why the corona is so much hotter than the sun's surface, suggesting that the corona is superheated due "nanoflares." A complex system of plasma, magnetic fields and energetic particles that can spark solar explosions trigger these flares. If an abundance of nanoflares erupts from the sun, that could explain the coronal heating. The red wheel on the top of the spacecraft, dubbed the wagon wheel, simulates the mass of the heat shield during testing. As the stream of particles leaves the sun, it can actually speed up instead of slowing down, Fox said, racing toward the Earth (and other planets) at millions of miles per hour. Data that will be collected by the Parker Solar Probe is "the last piece of the puzzle for us to model the sun and its effect on the Earth," Fox said. Fox added that this mission will also help us better understand other stars in the universe by studying our star in great detail.